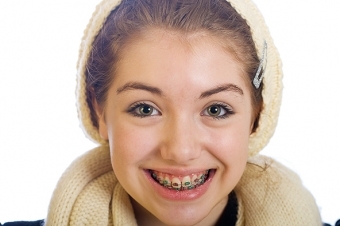 There are numerous types of braces available these days, but traditional metal braces are still the what people tend think of when they picture braces. Here, our Maple Ridge orthodontists tell a little about these classic orthodontic appliances. There is a growing variety of orthodontic treatment options available today, nonetheless traditional metal braces are still the most common teeth straightening treatment for orthodontic patients. That said, metal braces have changed a great deal over the years. Today’s metal braces are much smaller, lower profile, and more comfortable than previous versions. It won't surprise you that metal braces are made of metal! Generally, they’re made of high quality stainless steel or titanium. The brackets are the part of the braces that are attached to the teeth using special bonding material that holds them in place. The archwire puts pressure on the teeth to guide them into their new positions. The archwire is the thin length of metal wire that connects the brackets to each other. Your ligature elastics are the coloured (or clear) ties that hold the archwires to the brackets. Your orthodontist will change the ligature elastics at every appointment. Since they are changed frequently many people have fun changing up the colour combinations at each appointment. Metal braces exert continuous pressure on your teeth. It is the force of this pressure that moves your teeth into their correct positions. It is likely that your orthodontist will tighten the archwires and replace your rubber bands each time you see them for an appointment. These steps are required in order to make sure your treatment progresses. Metal braces are among the most popular and cost-effective orthodontic treatments available but of course each patient is unique. Your orthodontist can help you determine which treatment is best for your smile. Contact the orthodontists at Ridge Meadow Orthodontics in Maple Ridge today to schedule an appointment and learn more about how braces can enhance your smile.